Speaking at Roy Thomson Hall in Toronto at the launch of the Junior Encyclopedia of Canada in September 1990. I really had the best job in the country, as editor of Canada’s national encyclopedia. It was kismet for a boy whose irritated mother sarcastically called him “know it all!” As a kid in West End Toronto, I was obsessed with the only two books in our house, a one-volume encyclopedia and a small pocket dictionary my father carried with him in the war. I memorized maps and capitals and painters’ names from the encyclopedia—30 years out of date as it turned out. My father, who claimed to have memorized the whole dictionary, would rouse me from sleep in the middle of the night and make me query him on definitions (I had to be diplomatic about wrong answers as he was an agitated man when drunk and accused of error). Another happenstance struck when a misguided teacher in high school determined to punish me by sentencing me to the school library to hand copy articles from Encyclopedia Britannica. Bliss. Ring House 4, the original office of The Canadian Encyclopedia. Editor in chief’s office upper floor, left front. Like the average Canadian, I hardly knew a fact about our history or a word of French, but I worked over every word in that book in both languages, surrounded by Funk and Wagnall’s and Harraps, Fowler’s Modern Usage and Words into Type, and I worked elbow to elbow with the authors, one of whom, Fernand Ouellete, barely spoke English. I did not kid myself that I was chosen because I was some kind of editorial genius—I was their last hope. I hired my artist friend Phil Balsam to make the illustrations (beautiful woodcuts) and we went off together to collect photos. 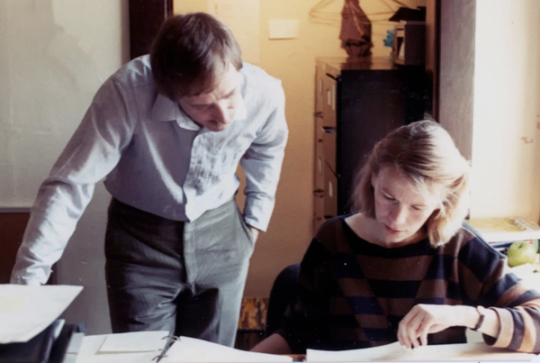 I sat day and night at the printer’s, correcting and approving proofs, learning the trade, drinking coffee and gaining the friendship of the pressmen. I presented that book, Canada: Unity and Diversity, to Ontario Premier John Robarts at the first premiers’ conference in 1967. The hardest part of all was getting on the elevator with ten copies at the newly opened Toronto Dominion Centre and soaring 55 terrifying floors. I had never been able to get on an elevator before! Book publisher and Canadian nationalist Mel Hurtig sold the idea of a new Canadian encyclopedia to the Alberta government as a “gift to Canada” on the occasion of the province’s 75th anniversary. I spent the next 13 years editing and writing Canadian books (I had the honour of editing an edition of George Grant’s Lament for a Nation), much of it ensconced in Carleton University’s Institute of Canadian Studies, taking courses, becoming friends with historians and writers (and even social scientists), learning more about aspects of Canada from every manuscript. In 1980 Mel Hurtig decided that this experience prepared me to be the editor of his new encyclopedia (I was not his first choice either), newly funded by Peter Lougheed for the province of Alberta’s 75th anniversary. It was another stroke of blind luck really. I had taught myself to read French but could not speak it and had no flashy PhD—I would not have been acceptable to the Canada Council had they funded it (they had turned it down). Reading under the statue of Diderot at the Paris Opera. Encyclopedias have a long, illustrious history, none as influential or renowned as Diderot’s Encyclopédie. With senior editor of the social sciences Patricia Finlay during the preparation of the first edition, 1984. I like to think that the values and ideals that I learned from these great projects created a beating heart for The Canadian Encyclopedia. Though I am a nationalist, unlike our renowned president Mel Hurtig, I never set out to claim too much for our endeavor (he had to market and sell the thing, which he did brilliantly). 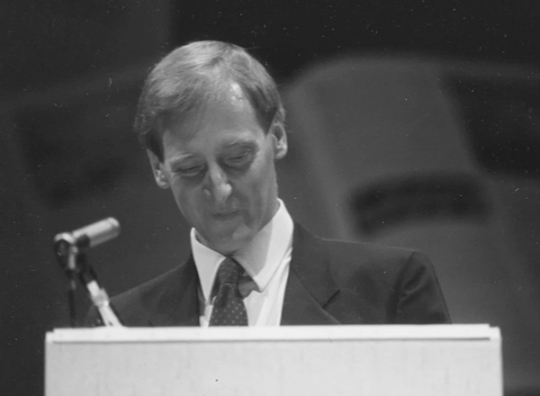 It is the greatest honour of my working life to have been hired—and then trusted without question—by the two greatest Canadian nationalist publishers Jack McClelland and Mel Hurtig. Their voices and contributions have not been replaced in our culture. Mel Hurtig walks up into a podium in the shape of the bound and boxed first edition to speak at the launch party at the Citadel Theatre. Holding a copy of the specially bound edition, one of only 25, inscribed to me for an “heroic accomplishment” in 1985. Thinking of these things underscores how profoundly the world has changed since that bookish world in which The Canadian Encyclopedia was formed. The first edition was typeset, stripped up in “repro” by the book designer David Shaw, and printed just as it might have been 100 years ago. The digital tsunami swept all of that aside. Through all this, I tried to stay focused on the same goals: to make available the most comprehensive general reference work possible on all aspects of Canada, to provide an educational tool full of facts and analysis, to involve the whole country in the making, and to adhere to the editorial values of authority and balance that would survive the latest trends in wikis and social media. As editor in chief, I admit that I allowed my own values to influence the article list of The Canadian Encyclopedia, for I see the peculiarities of our country’s bi-national (French and English), multi-ethnic and regional diversities to be both our strength and our challenge. I found the encyclopedia a wonderful means of representing this—much better than narrative histories or theoretical treatises or literary paens. It was a way also in my mind to avoid the usual simplistic nationalistic clichés with a more nuanced and even paradoxical presentation. 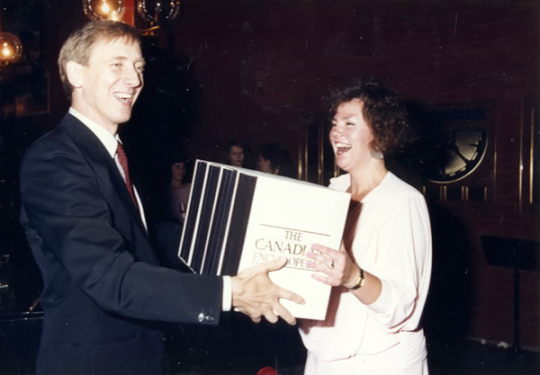 Presenting copies of the first edition to Minister Sheila Copps at the National Library in Ottawa, 1985. In order to achieve this representation of diversity, I rejected the idea of a group of staff authors gathered in Edmonton or Toronto or anywhere writing the whole encyclopedia (this had been the publisher’s intent). We hired over 3,000 contributors from every part of Canada to write not only about their regional subjects but also to add their perspectives on national issues. In addition, I had another principle (I won’t call it a bias) that Canada is, unknown to itself, a very creative country, and I was determined to represent that creativity through the arts and music, literature, sports and the contributions of our First Nations—I wanted to avoid the mundane activities of petty politicians and bureaucrats that comprised so many reference works in the past. Premier Peter Lougheed congratulating me at the launch of the first edition. I have become acutely aware, as I was not in the 1980s, that the technology of information delivery deeply affects content (it is not, Mr. McLuhan, the message itself). Because it was in book form, the encyclopedia had to be brief and limited in order to be financially feasible (and to get it produced in only 5 years). Books are still a marvelous technology, allowing a sense of permanence, of touch, of juxtaposition, of sensing the whole, of freezing time. Much of this has in fact been lost in the digital world. Of course much has been gained. Even on our CD-ROM editions, the ability to search the entire database with speed and precision was an enormous help to using the text as an educational tool. Also, the addition of multimedia added to the enjoyment and richness. Online, the restriction of length has disappeared, making the choice of length of article or completeness of lists (such as populated places or geographical features) less arbitrary. Yet the challenge remains—not met or even considered by Wikipedia—of authority or balance or usefulness. Also, whatever its accomplishments, a work such as Wikipedia, no more than a search for “Canada” in Google, cannot present, as we do in The Canadian Encyclopedia, a comprehensive portrait of our complex, wonderful nation, or give a sense of what is significant, lasting. What was chosen to be in the encyclopedia was decided by the editors and ultimately by myself with as much expert advice as we could acquire. When I myself had suggestions they were put to the same scrutiny (often without success). Profiled in the Edmonton Journal, 1991. Though it is an imperfect and arbitrary benchmark, we can point out some measure of success in receiving over 500,000 unique visitors to the site most months. While not in the stratosphere of Google or Wikipedia, this is impressive for a Canadian reference work and is far beyond the audience that we could achieve with books. We nurtured this audience as best we could by trying to be diligent with search engine optimization and usability and most recently by producing a mobile version that is responsive to all mobile devices. As a special guest at the opening of the new Toronto Children’s Library with students, showing all the information that can be stuffed onto one CD-ROM. The online world has presented us with opportunities that it had been my intention to take—and I have sought advice far and wide—through the innovations of Web 2.0, to the omniscience now of mobile and apps and the current buzzword of “responsive” design. Recently, we and our programmers at 7th Floor Media in Vancouver completed an app for Apple and Android called “Toronto in Time” that greatly expands the idea of what an encyclopedia might be, rooted in locality and in narrative—all done with the same principles of authority, comprehensiveness and diversity as The Canadian Encyclopedia. I had hoped to produce such apps for all Canada’s major cities. Certainly one of the greatest pleasures that I have had, in addition to a close relationship with the scholarly community, has been the positive and often personal relationships that I have made with those in the technical world: the programmers at SnappMx in Edmonton, the designers and programmers at 7th Floor Media in Vancouver, our SEO expert Alan K’Necht in Toronto and Scott Cuff at Interware. I have loved learning from these and others. I hope that I am being clear that to maintain its value and usefulness to Canadians, however technology changed and however we expanded the scope of The Canadian Encyclopedia, that it always remained based on those sets of principles—authority, balance, accuracy, editorial control—without which we would become yet another unreliable wiki or tool of self promotion! We believe that our accomplishment of creating the content of The Canadian Encyclopedia (over 50,000 articles and 15 million words) is a good start, that we are very fortunate that an encyclopedia is so very adaptable to the web and that the unique richness of this content will continue to be of service to Canadians in understanding themselves. Perhaps the greatest challenge that we failed to meet in the digital realm is to recreate that sense of the whole, dare I say of wonder, that is so much more palpable in sets of books. 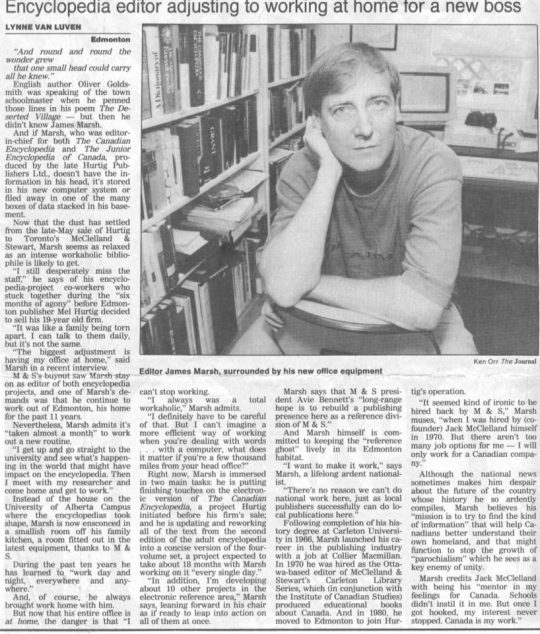 James Marsh is Editor Emeritus of The Canadian Encyclopedia. He deeply appreciates the support of Avie Bennett and the Canadian Studies division of Canadian Heritage for the support that has kept The Canadian Encyclopedia vibrant. Very nice remembrance. I still have the original encyclopedia in my home!